sjhoward.co.uk » What’s in my daily work bag? 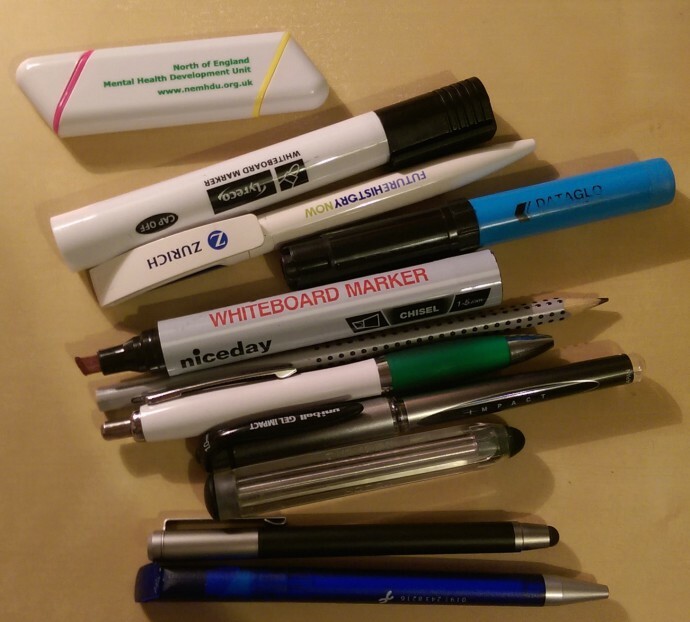 What’s in my daily work bag? Published on 3 February 2015. Over the last few years, there’s been a growing trend in business publications and productivity websites to ask notable people what they carry in the bag they cart to work each day. These people always seem to have a well-organised kit of polished shiny expensive things, and an astounding absence of junk. I struggle to relate to this. So, to redress the balance, here’s what’s in my bag. This is my bag. 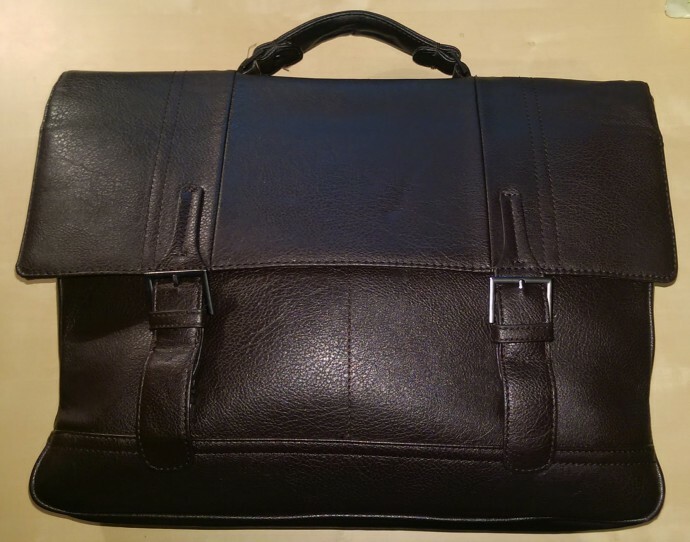 It’s a Jasper Conran briefcase that Wendy bought me a few years ago. It’s dark brown, and I usually carry it while wearing a black or grey suit, which probably counts as a fashion crime. 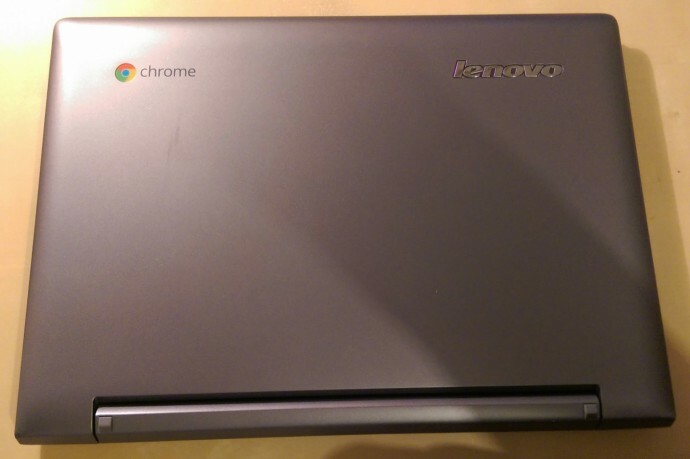 This is my Lenovo N20p Chromebook, which is the laptop I carry most often. I do have a work-issued ThinkPad, but this is faster, lighter, has better battery life, and does most of the things I need to do on the move—even more so since the Office webapps were upgraded. The battery life is so strong that I don’t bother carrying the power cord. 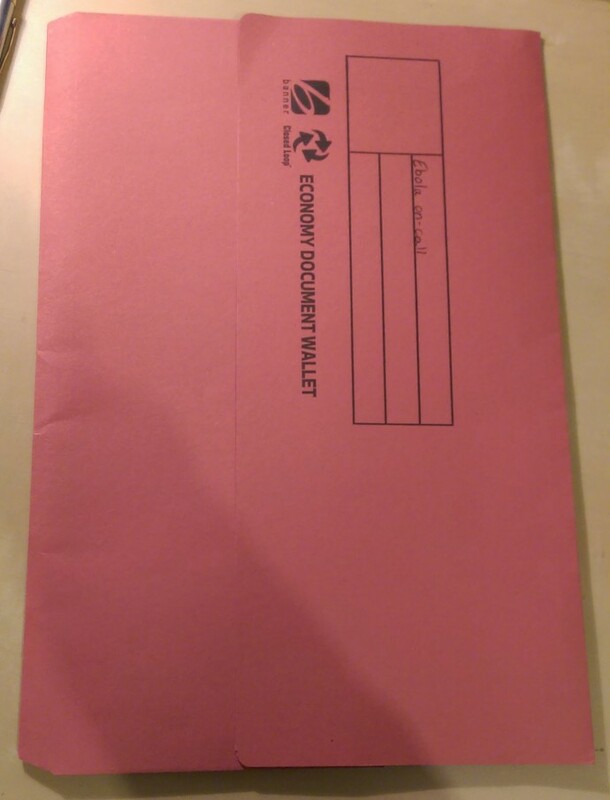 I usually carry a stack of these cardboard document wallets with papers related to projects or meetings in them. This one is a bit atypical: I usually label them with a sticker in the top-right corner with the title, place, date and time of the meeting they relate to. After the meeting, I typically over-label the sticker and reuse the folder. This is a great system because it is so flexible: it doesn’t feel ridiculous turning up to a meeting with a stuffed folder, or with a folder containing only one sheet. And with top-right labelling, I can see where I should be and when by just flicking through the stack of folders in my bag. 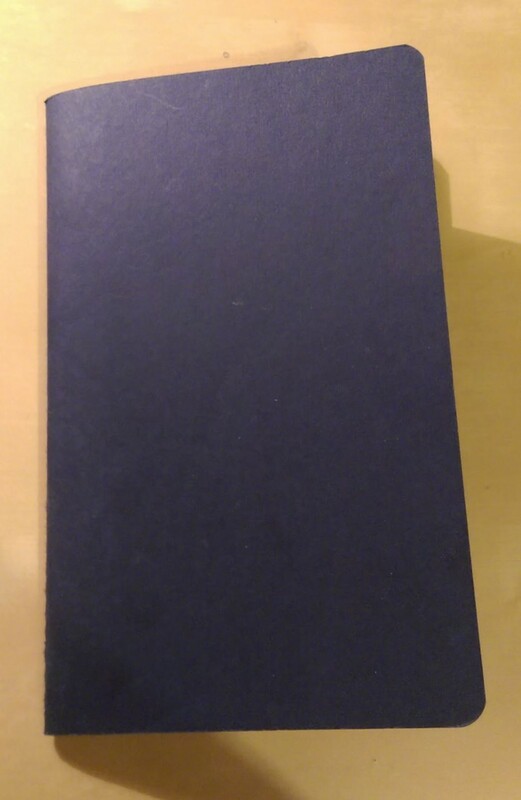 This is a Moleskine Large Ruled Cahier Journal. This is what I take notes in. I usually have about three of them on the go at any one time so that there’s always one to hand. The paper in them is great quality Moleskine stuff, which is great because I like to write with inky pens. The cardboard cover is just about sturdy enough not to get bent out of shape in my bag. And it’s just about informal enough to doodle in, and still formal enough to scribble down minutes when required. It’s a great product. 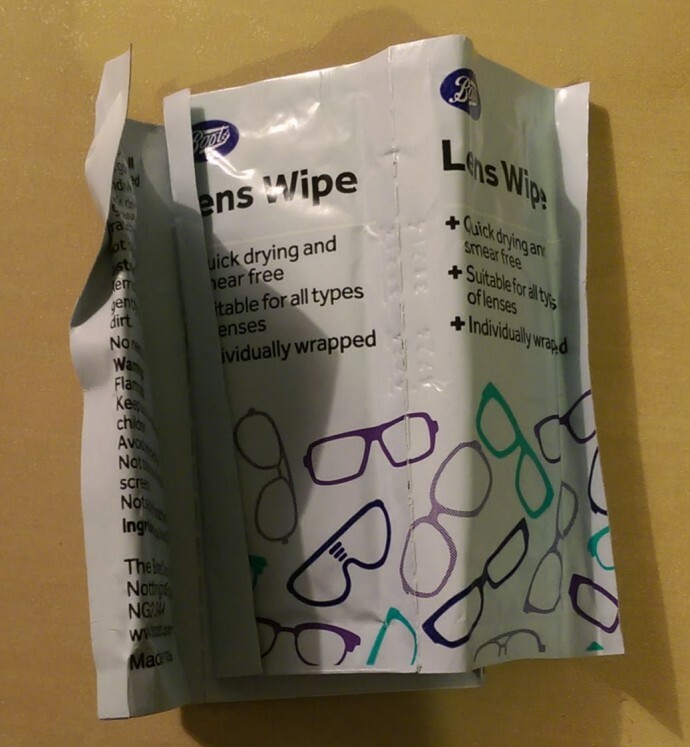 These are some individually wrapped Boots lens wipes. I have these secreted all over the place. There’s nothing worse than having a giant smudge in the middle of your glasses and no easy way of cleaning it off. 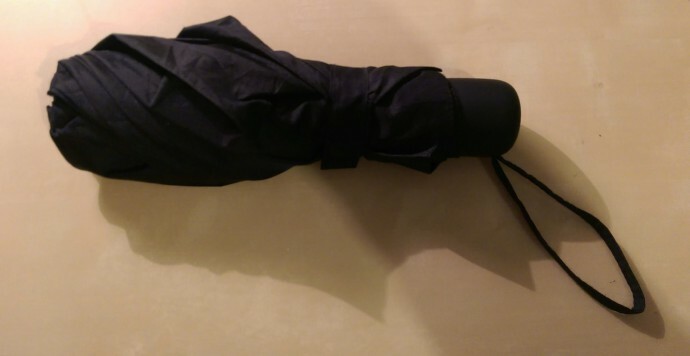 This is an M&S umbrella; I can’t link to it as they don’t sell this model any more. It goes up, it goes down, and it keeps me dry. I’ve never yet seen a profile of someone’s work bag which includes an umbrella, which strikes me as slightly baffling. 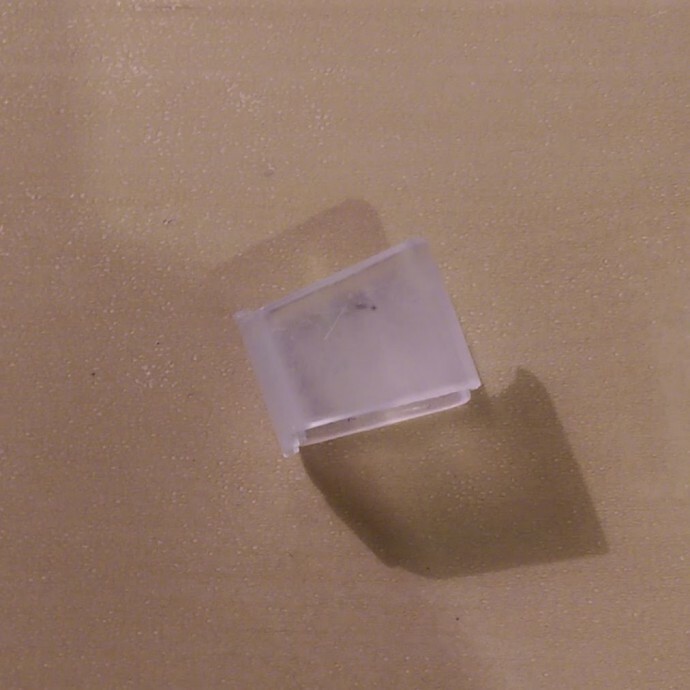 This is a random plastic wotsit I found in the bottom of my bag. I’ve no idea what its function in life is or was. I probably won’t throw it out though, just in case. 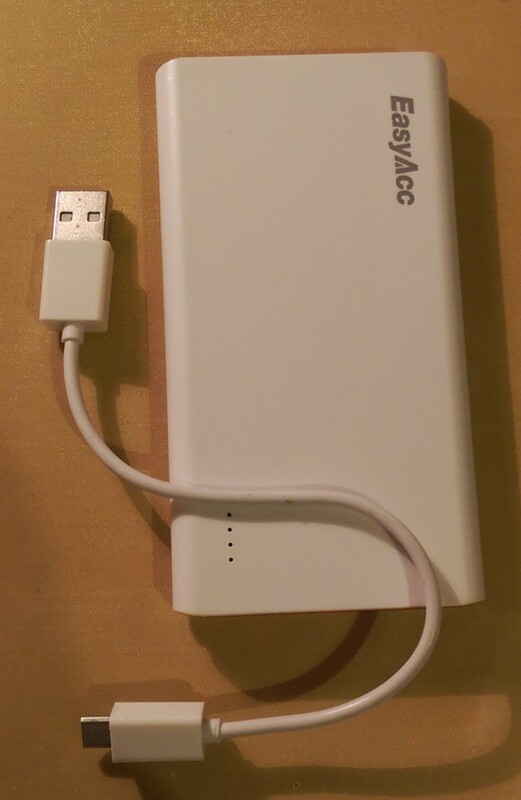 This is an EasyAcc PowerBank which I rarely use, but which occasionally saves my bacon if my phone has run out of juice. When the PowerBank is charged, it seems to hold its charge forever, so it works well as an emergency top-up device that I can just leave rattling round my bag. 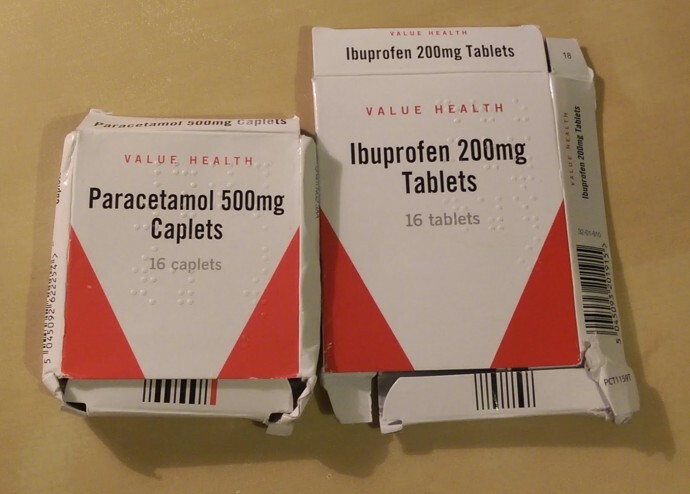 These are pharmaceuticals (paracetamol and ibuprofen), busting the stereotype that men don’t carry this sort of thing. I very rarely have recourse to use them, but I’m always very glad I have them when I need them. These particular ones came from Boots, and are about 20p more expensive than the equivalents in the major supermarkets. I must have been feeling flush when I bought them. 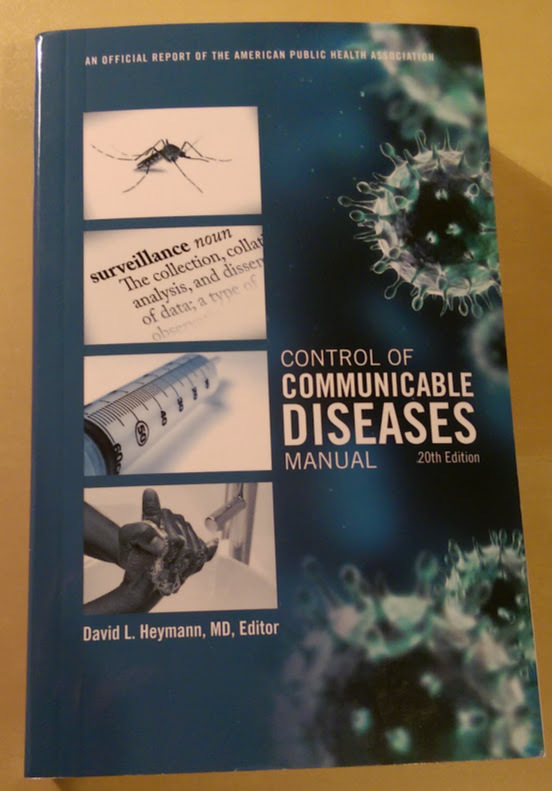 The Control of Communicable Diseases Manual is a book a refer to constantly, and this is the brand new 20th edition that I bought only last week. I had the good fortune to met its esteemed editor, David Haymann, once—though didn’t find out that it was him until afterwards. I dread to think what smalltalk I subjected him to. Sorry. This is an empty flash drive that I carry just in case. This particular one is from Maplin (they don’t seem to sell this variety any more), and was bought in a crisis when I couldn’t find any of my 6,000 other flash drives. My talent for losing these things knows no bounds. 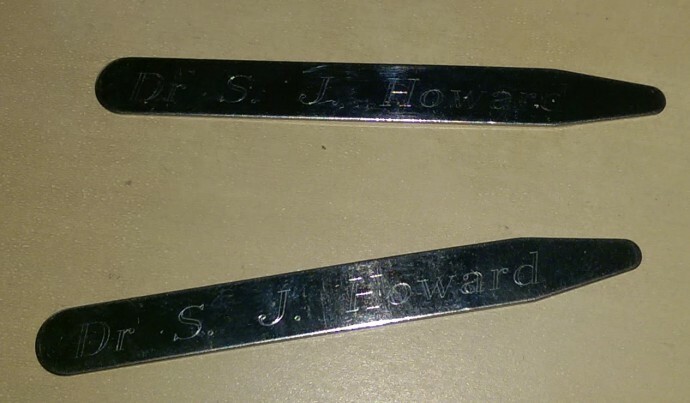 This is a pair of engraved steel collar stiffeners. I’ve no idea how they got in my bag, but then: who doesn’t have a pair of engraved steel collar stiffeners in the bottom of their bag? 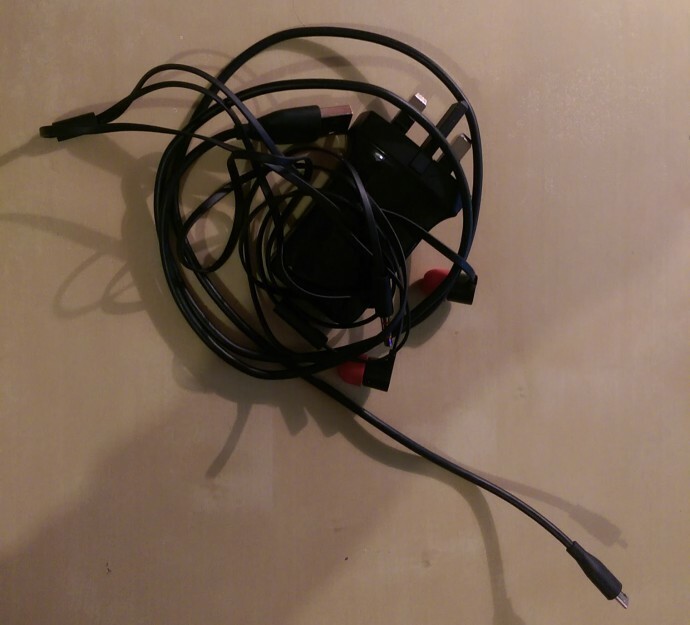 This is an entanglement of my phone charger and headphones. I rarely listen to anything other than speech through my headphones, so I just use the ones that came with my phone. Apologies to any audiophiles who wince when they see people like me. The phone charger is also the one that came with my phone. It’s a handy one to carry as the earth pin slides down to make the plug more compact. A clever bit of design! 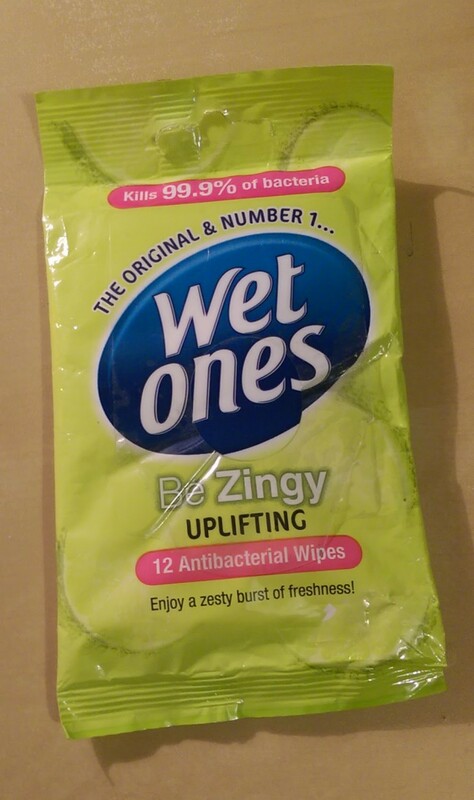 Confounding stereotypes again: Wet Ones. Another thing I don’t use all that often, but feel very glad that I carry whenever I do need to use them. This is a collection and a half of writing instruments. I’d love to have a strong rationale for each on of those, but it really is just a jumble. My preferred pen is the black Uniball Gel Impact—there is one of those in there, but there would usually be two or three. The rest are mainly freebies from here and there. You’ll be pleased to hear that I retrieved the lid for the whiteboard marker just after I took this photo. This is a free name badge that MPS gave me and all of my fellow medical-school graduates. I’ve never worn it: it’s another thing I carry just in case. As I write this post, I’m wondering what possible situation could arise where I’d need this… but nevertheless, it stays in the bag. And finally… a book. I always carry a book to read on the Metro. 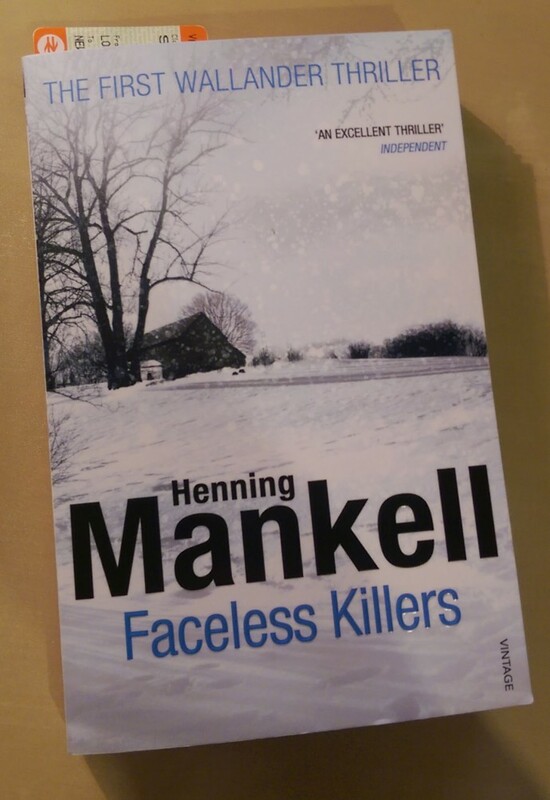 I’m about two-thirds of the way through Faceless Killers at the moment. No spoilers please. This 2,296th post was filed under: Reviews.